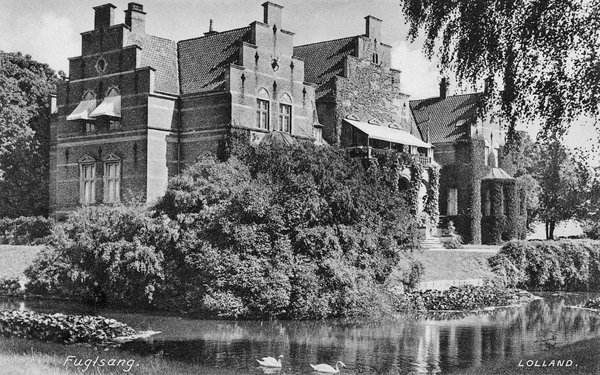 From 1892 onwards Julius Röntgen spent practically every summer holiday with his family at manor house Fuglsang in Denmark. Every summer a great many friends and family of the residents, Viggo and Bodil de Neergaard, would come together, among whom many musicians from the Scandinavian countries. Bodil de Neergaard was a daughter of the Danish composer Emil Hartmann and herself an excellent singer. Fuglsang has a beautiful concert hall and tradition would have it that during the summer months music would be played here (nowadays concerts still take place there). 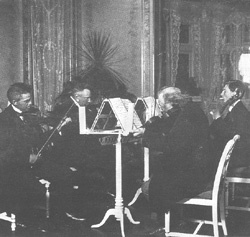 Carl Nielsen belonged to the regular guests and a special friendship grew between him and Julius Röntgen. Nielsen dedicated his Helios Overture to Röntgen and he revenged himself by then dedicating his Piano trio in C minor op. 50, which was first performed at Fuglsang in the summer of 1904, to Nielsen. Röntgen was a keen advocate of Nielsen and introduced his music to Holland. In Danish musical life Nielsen was a unique personality. Being the son of a farmer he felt tremendously drawn to country life. At Fuglsang he enjoyed lying in a meadow, using a grazing cow as a pillow and to be inspired by the murmuring sounds of its intestines.